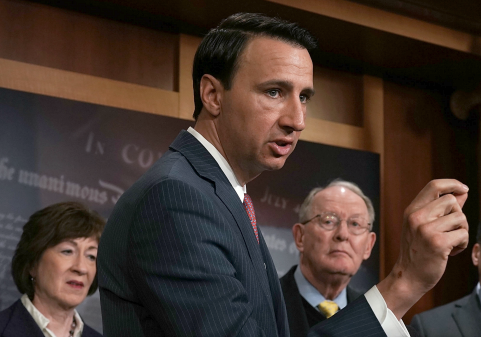 Republican Rep. Ryan Costello (Pa.) announced Sunday that he will not seek reelection in his suburban Philadelphia district, citing the level of hatred that has permeated the national political environment, especially "from the left." Costello, a two-term congressman, confirmed his retirement to the Daily Local News. He cited the current tumultuous "political environment" as a primary factor in his decision to leave Congress. "I think there is a lot of hate out there, from the left especially, and it's a very angry environment," Costello said. "It is a sad commentary on the state of our culture and political environment. It's not me doing it, but I am the one who gets the brunt of it." "It's not the kind of environment I want to raise my kids in," Costello continued. "Some of the stuff that gets said about me, some of the things that people do, I find extremely distasteful. Now is the time to take the appropriate look at the environment and say, even upon winning in November I think the way things are going to be baked into the cake through 2020, and I am not interested in putting my family through that." The congressman also said that, "no matter how bipartisan and open and transparent I am, there is so much anger out there that it doesn't matter." Costello also lambasted the Pennsylvania Supreme Court for its decision in January to alter the state's congressional map in an election year. Costello suggested that the decision was politically motivated in an attempt to purge sitting Republicans from marginal districts, like himself. "I was surprised and am still absolutely shocked that the Supreme Court got away with what it did," he said. "Their objective was to take me out politically, and that's what they did." Costello's retirement may help put Republicans' control of the House of Representatives into jeopardy. Costello won his first two elections in 2014 and 2016 by comfortable margins, but his district is marginally Democratic on paper. In 2016, Hillary Clinton carried Pennsylvania's sixth congressional district by one point, even though she lost the state overall, and under the new district boundaries, Clinton would have carried the district by a wider margin. In November, the Democratic Congressional Campaign Committee launched ads castigating Costello for his votes in favor of the GOP tax reform plan and against Obamacare. One of the ads claimed that Costello "takes money out of the pocket of middle-class families." This entry was posted in Politics and tagged 2018 Election, DCCC, House of Representatives, NRCC, Pennsylvania, Redistricting, Republican Party. Bookmark the permalink.